This section explains how to interact with OptiShot to make changes various settings and to how to display specific information. 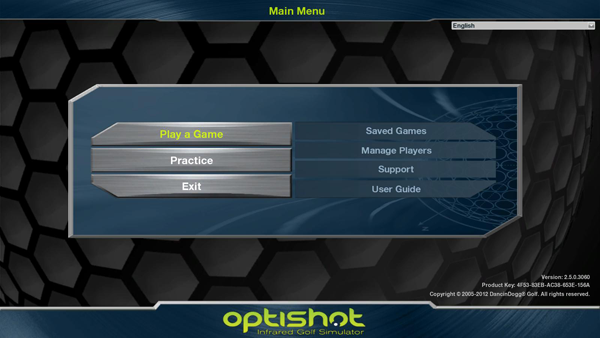 The Main Menu window is where you begin your OptiShot experience. As you can see above you have the options to begin to Play a Game, to Practice on a course or the Driving Range, or go to a Saved Game. Additionally you can get to the Manage Players window or access the Support website and online User Guide. This is also where you Exit OptiShot. Details on these actions can be found in the Game Mode, Practice Mode and Creating & Managing Players sections. In each of the 4 corners of the Optishot window are Menu buttons. These open the function-specific menus. The Shot Info Menu is located in the upper left hand corner of the screen. 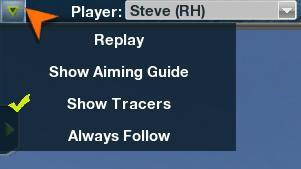 Show Aiming Guide - shows or hides the aiming reticle. The Location Menu is located in the upper right hand corner of the screen. The Clubs Menu is located in the lower right hand corner of the screen. The Tools Menu is located in the lower left hand corner of the screen. You can perform a variety of actions in OptiShot using your keyboard. Below is a list of these actions and the keystrokes that will activate them. Note: Ctrl refers to the Control key on your keyboard. Ctrl+A means that you hold down the Control key and the A key at the same time. Esc is the Escape key, usually found in the upper left corner of your keyboard. F5 and F9 refer to the function keys at the top of the keyboard. * You can also change aim by using your mouse. Hold down the right mouse button and drag the mouse to the left or right in the main display. ** You must have created a custom clubset to edit the clubs. You cannot edit the default clubsets. The Settings & Options Window allows you to change global settings within OptiShot. To access these, click Settings & Options on the Tools menu in the lower left or you can press the F5 key on your keyboard. The Settings page contains three sections: General Options, Shot Data DIsplay and Camera View. Check this box if you want OptiShot to display distances in kilometers (km) instead of yards. If you have Metric Distance selected, you can have OptiShot display speeds in meters/second (m/s) or in kilometers/hour (km/h). Simply select the measurement you desire. By default OptiShot is set up to sound like a real golf course -- wind, birds and so on. If you do not want to hear these sounds, uncheck this box. Note: The standard sounds, the swing of the club, striking the ball, the ball landing, will still be heard. If you wish to turn off all sounds, you can go to the 3DD Golf Settings window. When you reach the green a grid appears over the putting area to help guide you in your putts. (see The Putting Grid for details.) You can elect to show or hide this grid by checking or unchecking this option. If you have the Putting Grid visible, this option will overlay rolling golf balls on the grid to show you how your ball will break at various points on the green. This choice will cause the Shot Data to display briefly (approximately 8 seconds) immediately after each shot. If you select this option, the Shot Data display will show all the time. Selecting this will hide the Shot Data display entirely. This option will result in you remaining at the point the shot was taken and the ball will travel away from you down the course. Choosing this will have the camera follow the ball through the air. If you check this option, OptiShot will give you an elevated view of the course at each Tee. Unchecking it will result in the camera remaining at ground level at the Tee. Slow, Medium-Slow, Medium, Medium Fast and Fast. Select how difficult these shot are. Choose the direction of the wind. Here you set the rules for game play. There are two groups: Options and Putting. Select whether you want to allow players to take a Mulligan during game play. This means that each player must putt the ball into the cup before proceeding to the next hole. 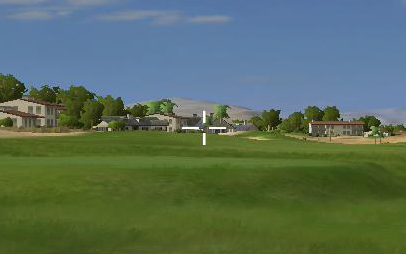 When a player lands within the distance set they will be able to enter the number of putts they believe it would take them to complete the hole. Once the ball is within the set distance of the cup, OptiShot will assess a 1 stroke putt and complete the hole. When you are within the set distance, OptiShot will calculate the number of putts - these will range from 1 putt to 3 putts. As you move through the clubs, OptiShot will display a picture of each club type. Once the club displayed in OptiShot matches the club you are using, you may proceed with your shot. 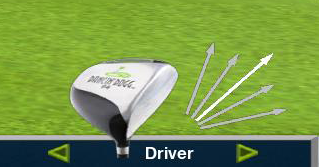 You can also change the entire Clubset being used. Open the Clubs menu in the lower left and click on Manage Clubsets, select the Clubset and click OK. Shot Type is the average shot you hit with your clubs. A low Shot Type will result in longer distances than a higher Shot Type. In the Creating and Managing Players section we will talk about how to set a Shot Type for a particular player. This Shot Type will be applied to that player within OptiShot. However, on any given shot, you may select to change the Shot Type. To change the Shot Type, click on the arrows next to the club display. You may also use the Ctrl+Up Arrow and Ctrl+Down Arrow keyboard shortcuts to change Shot Type. You can play OptiShot using a real golf ball, the included foam ball or no ball at all. Which ball you use will affect the shot calculations. The ball type selected in OptiShot should match the actual type you are using in order to give the best results. 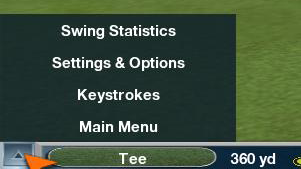 To change your ball type, open the Clubs menu in the lower right and click on Select Ball Type. In the submenu displayed select the ball type you are using: Real Ball, Foam Ball and No Ball. 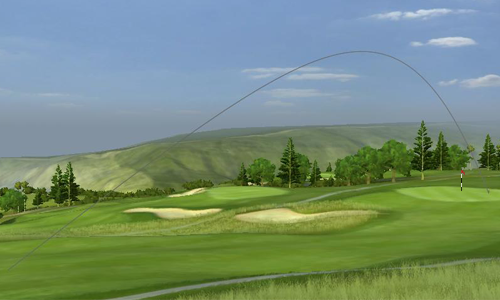 OptiShot offers you two different views of the course. Normal (ground level) and Elevated. At any time you can switch between these views by opening the Location menu in the upper right and clicking on Elevated Camera if you are at ground level or Ground Level camera if you are elevated. Another option is to use the F9 function key on your keyboard. This Camera View will only apply to the current shot. The default view on any shot is from ground level. 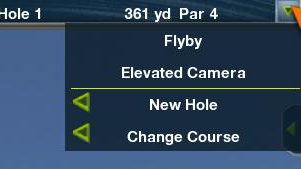 Note: One of the choices available to you in the Options window is to have an Elevated View each time you are at a Tee Box. This setting is not affected by temporarily changing your Camera View using the arrow or keyboard shortcut. At the beginning of each shot, OptiShot will set you up for the best alignment. At a Tee this will be toward the optimum position for your second shot. On each subsequent shot it will aim you directly for the cup. Note: For the best results you should always stand square to the Swing Pad and swing perpendicular to the sensors. If you need to change your aim, do not change position. Aim is handled from the keyboard. At any time you can change your aim. To do so, click on the left and right arrows at the bottom of the screen just above the Taskbar. You may also use the left and right arrows on your keyboard. Another option is to use your mouse. Hold down the right mouse button and drag the mouse to the left or right. As you change your aim, you will see the Course display shift to the new perspective. Also, the Aim Line in the Overhead Map will change to show you your new orientation. You will also see the Aiming reticle in the center of the screen. A Flyby is a bird's-eye tour from the Tee to the Green. This allows you to see the path the ball needs to travel to the hole. By default OptiShot takes you on this tour at the beginning of each hole. However, you can turn this feature off in the Options window. At any time, on any hole, you can manually start a Flyby by clicking Flyby on the Menu or using the F key on your keyboard. On the Driving Range the flyby is slightly different. You move out over the target flag and look straight down. This allows you to easily see the dispersion of your shots. 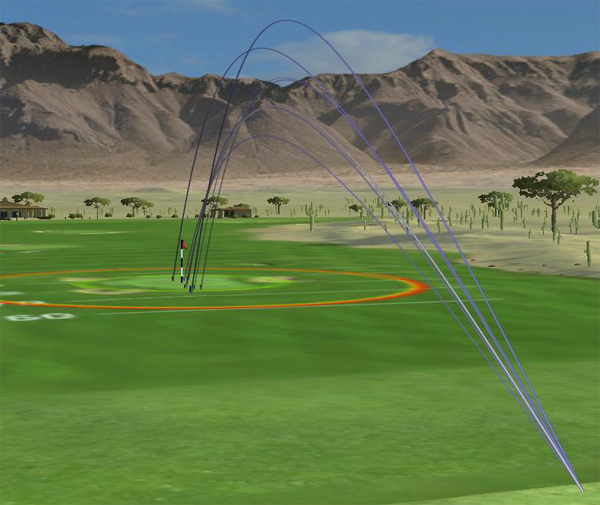 When you take a shot OptiShot shows you the ball's path using a ribbon-like display called a Shot Tracer. Shot Tracer on Hole 10 of West Maui Plantation. A Shot Tracer remains visible for a few seconds and then fades away. You can manually clear visible tracers by selecting Clear Tracers from the Menu or using the C key on your keyboard. When you are in Game Mode and have multiple players, each player's Shot Tracer will have its own color to allow you to distinguish between shots. 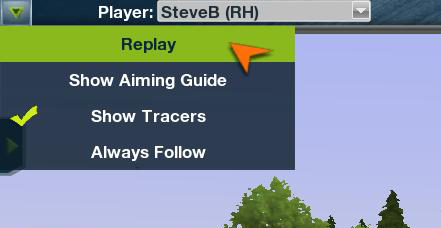 In Practice Mode, both on courses and on the Driving Range, you can select to have the tracers for all your shots remain visible. You can turn this function on and off using the Show/Hide All Tracers icon at the bottom of the Overhead map. You will note that you can also Show/Hide All Balls. The Driving Range with Show All Tracers turned on. OptiShot allows you to Replay the last shot taken. To view a Replay, open the Shot Info menu in the upper left and select Replay. 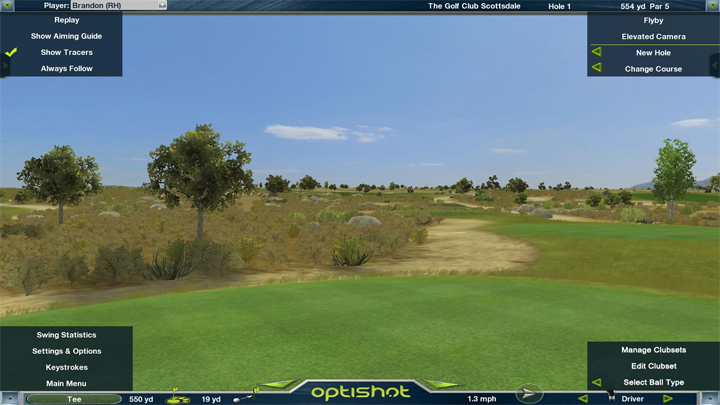 If you have made a particularly tricky or difficult shot, OptiShot will show the message "Excellent Shot ! " and will replay that shot automatically for you. Auto-Caddy is the way in which OptiShot selects clubs for you as you move through a course. When you are at the Tee, your Driver will be selected. When you reach the green, your Putter will be selected. In between, Auto-Caddy will select the club best suited for your current distance from the cup. The distances for the clubs are defined in the clubsets. You can create custom clubsets and modify the Average Distance for a club, changing when it will be selected by Auto-Caddy. Note: Auto-Caddy only considers distance, it does not select based on your lie. If you are in a bunker or the rough, it will still select whichever club in the current clubset is defined for that distance from the cup. 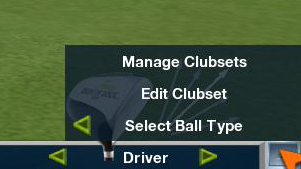 As mentioned above, you can manually change the club you are using at any time.